The Olympics were a formative event in my design career. It was 1984 and the Games were in Los Angeles. I was a kid in Virginia. Something about the look of those games was unlike anything I had ever seen before. I remember watching on television and how the colors and patterns and symbols seemed to flood the screen everywhere - not the on-screen television graphics, but the graphics on the venues and in the stadium and even the backgrounds of the shots. While commonplace today, at the time, they were bold and colorful and distinctive. And what I liked best, they said "America" without ever using the colors red, white, and blue. I now know that these games were designed by Deborah Sussman of Los Angeles design firm Sussman/Prejza. I don't know for sure, but I believe these were one of the first games to utilize a complete visual identity system that covered everything from stadiums to hot dog wrappers, from signage to flower arrangements and medals and contestant numbers. It spurred my original interest in graphic design, and even led me to an independent study in 'environmental design' in design school. It also was probably an influence in my love to this day of complete identity systems and packaging that unify all kinds of disparate elements with one look. In 1998, angered by unauthorized elements in Atlanta in 1996, the International Olympic Committee established the Olympic Games Identification Project, which established guidelines for the "look of the games" - mandating that such a visual system be designed for every games. While lacking in some places as far as being completely comprehensive (surfaces left uncovered or elements not incorporated fully), the Torino 2006 games did have a nice design system. It was meant to symbolize and reflect the concept of the Piazza as well as the mountains and light coming from them through the use of transparency, perspective, and contrast. There was a palette of warm colors as well as one of cool colors, both of which coexisted nicely when side by side. It was clean and energetic and consistent. 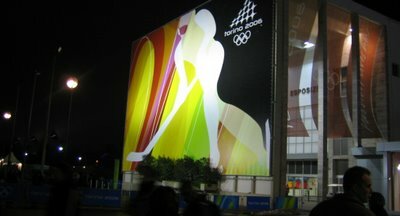 I could not find any credit for who designed the look for the 2006 games. On a side note, I am referring here only to the on-site graphic design of the games, not the on-air look and design. I don't know if it is not permitted by the Olympic Committee or if it is a conscious choice not to, but I wish television networks would use the look of the Olympic games as a basis for their on-air design as well. The last time I can find that this has happened was in 1996, which was also far and away the most impressive and effective on-air package for an Olympics as well, in my opinion. When the on-screen matches the on-site, they work together as one unified package. This would make it look like the stadiums are covered by the television networks graphics and that the Olympics really 'belong' to that network, while also enhancing the visual design goals of the Olympics themselves by echoing them in the on-air presentation. Its a true win-win situation. congrats on being back in sunny - er, stormy - california!! !